The word »authentic« seems to be a frequent feature of Austria's LEWITT info material, online presence and marketing. And, in all honesty, I now totally understand why, so I'm having no problem whatsoever in resorting to it pretty often for this review of mine of their microphone. 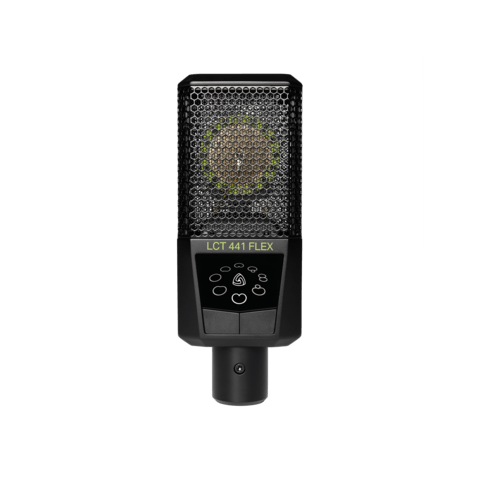 The LCT 441 FLEX is one of their mid-range microphones in terms of price, selling for just under 400 EUR in Europe or 400 USD in the USA. But (and here is the first of the “authentic surprises”), there is actually nothing cheap or even middle-of-the-road about this microphone’s build, looks, plentiful interesting features and more importantly about its sonic qualities, as I will try to explain in detail. In a world of cloning & replica galore, and in a long sad wave of supercheap microphones made with supercheap parts & construction methods in the Far East and then either sold dirt cheap or rebranded with fancy names and even high-flying name badges from the past (along with often dubious claims of being hand tested or carefully & lovingly assembled in some western boutique lab by sonic gurus), LEWITT have bravely chosen to go for a completely different angle. The 441 FLEX is made in China, the box clearly states so, but it bears no resemblance or family lineage with any other Chinese mic that I know of or have read about – it is made for LEWITT and/or by LEWITT, much as a generous number of parts of your Italian sports car or key parts of your American computer will be made in the Far East: it’s a way of keeping the costs down, and not a way of tricking you into buying junk. Because this is a robust build, made of brilliantly well-finished parts on a die cast zinc body, with attention to detail and zero rough edges or apparent cutting of corners. To underscore this, the design itself of the microphone, the packaging and the generous array of accessories it comes with bear little or no resemblance to any microphone you might find around, in any price range. In fact, if there is some vague resemblance, it’s a wink at the classic AKG C-414 "electric razor/toy coffin" shape, which one might perhaps interpret as a nod to “Austrian design”. The cardboard box in which the 441 FLEX arrives also contains a sturdy, secure square-ish shockmount with screw on fastening at the bottom and mic stand thread adapters, an excellent minimal metal mesh pop filter that magnetically clicks into place on the shockmount without the need for additional stands or clamps, a foam cap windscreen, a leatherette plush velvet lined pouch, and even a Lewitt rubber wristband – Instagram awaits! And, speaking of image, the LEWITT is not a grey anonymous mic that will hide in your studio session chaos, it’s a strikingly bold design with illuminated parts and the company’s trademark almost fluorescent green details, so it’s a piece of gear that sort of pleasantly screams “Hey, look here, there’s a Lewitt in the room!”, which is fine if the sonics to match the looks are there… and in this case they definitely are. The sound of the 441 FLEX goes abundantly above and beyond its price range. And, again, there are no signs whatsoever of the now all too commonly identifiable bad sonic characteristics of cheap, mass produced Chinese microphone capsules. Whoever designed and specified this microphone did a fine job, as did whoever oversaw its manufacturing and quality control. The published specs of the 441 FLEX with its 1” diameter, 3-micron gold covered Mylar capsule speak of rather high sensitivity with a super low 7dB noise floor, and a dynamic range of a whopping 137dB, meaning this microphone can take 144dB of maximum SPL without padding. 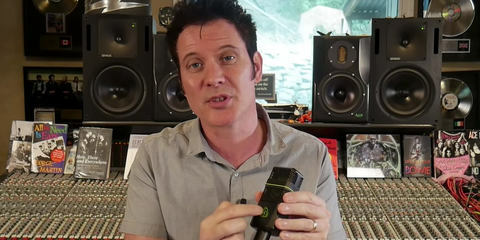 The Lewitt logo doubles as a “clip indicator” – clipping a preamp can be a thing and is mostly rather easily noticed and if need be tamed in the control room, but clipping at the mic stage often goes undetected and is far, far more detrimental, so in my opinion this feature alone is a total winner and an authentic godsend, plus a schooling for many. The polar patterns, of which there are 5 (cardioid, wide cardioid, omni, supercardioid, figure-of-8) but augmented to 8 (given that the unusual options of reverse cardioid, reverse wide cardioid and reverse supercardioid are also provided), can be switched and continuously circled via two really positive feel, hefty and lockable click switches, the moves of which are clearly indicated by well illuminated indicators. As a fun bonus, one can also randomize the polar pattern selection and let the mic choose… a gamble for the uninspired? The frequency response graph is not ruler flat but it is, once again, “authentically surprising”: no attempt was made to mimic any classic mic of the past, and no heavy-handed boosts or cuts were electronically induced to either compensate for deficiencies or to tease & please the ear of the unwary and lure in the beginner customer with glitter and boom. 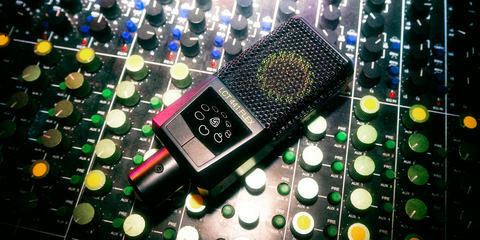 The sound produced by this microphone, in practice, very elegantly bears out exactly what the frequency graph depicts, with a bump at the top, but well above 10kHz and out of the sibilance range, a slight dip in the pesky and sibilant 5-7kHz range, and the overall feeling of a mild tilt-type eq favoring the high end and slightly attenuating the low end, pivoting around the 500Hz-1kHz area. There also is a little dip around 1.5kHz, of which I’ll say more later. These sonic characteristics are more or less common to all the available polar patterns. To my ears the flattest and neutral proved to be the supercardioid and right up with it the cardioid, with wide cardioid (a personal favorite of mine, whenever recording in a good sounding, well-treated room) being just a shade brighter, omni even more so and with a barely noticeable extra amount of the lowest frequencies picked up, and figure-of-8 coming across as the most “tormented” of all the 441 FLEX’s patterns, not in the sense of bad sounding, but just being the most audibly different from all the others. But far more than the good frequency response, what impressed me most is an almost unexplainable but very audible feeling of clarity, of super clean sound, with absolutely no trace of transient distortion or upper midrange congestion or lower midrange mud. In this respect, the LEWITT surprised me, being more than a notch above the microphones I compared it with, providing an authentic feeling of air, and a much desirable authentic transparency in its (you guessed it) authentic sonic signature. I had the pleasure of receiving a pair of 441 FLEXs from LEWITT, and I both tested them for the sake of this review, as well as used them on several actual recordings in a real-life studio situation, comparing these microphones to a Neumann U87i, to a vintage U87, to a Shure KSM32, and to my pair of 1990s AKG C414 B-TL II with the C12 type brighter voiced capsule. I used them on drum overheads, drum room, acoustic guitar, classical guitar, guitar room, outdoor ambience recording, and my own voice for both vocals and voice-over. Starting with the latter, working in radio on an everyday basis, I am very familiar with the sound of my voice through various microphones, especially the first three of the above stated mics, all of which I regularly use for work. The LEWITT 441 FLEX surprised me by being really dead quiet, even at high preamp gain levels, noticeably quieter that all the mics I was comparing it to, and by feeling more airy and clear than all of them. This “clarity” thing is a major factor here, and the characteristic I now most immediately associate to the LEWITT: clarity in the airy top end, clarity without sibilance, clarity in the upper midrange without ever any graininess or congestion, clarity in the low mids without any 250-400 Hz buildup or mud, and clarity in the fast, snappy low end. Yes, it sounds a bit “bass-light” compared to say the Neumann, but it also sounds even cleaner than that studio standard mic, if this is at all possible. This mic likes to be worked pretty up close, if you’re looking for proximity effect, as the low end stays fairly consistent and neutral up until at very close range. In this plosive challenging situation, the clip indicator LED and the excellent unobtrusive but effective clip-on metal mesh pop filter can be brilliant helpers. The 441 FLEX responded perfectly well to the eq moves I usually use for my own voice: a little boost in the 120Hz chest area, a little boost in the 1.4kHz articulation area, and an “air” boost as high up as possible. To get to the sound that I’m accustomed to, on those lows It needed 2dB or so more than I would usually do on the Neumann or the Shure, again in keeping with its frequency response graph, and it also needed a dB more in that midrange area. And this is probably my only frequency related (very minor) gripe, as I found that little dip in the frequency response around 1.5kHz audible, feeling a bit like a tiny notch down of that filter which some old Focusrite channel strips would call “Absence” – and hey, I seem to prefer presence to absence. But, on the plus side, the Lewitt needed none of the 400Hz mud cut that I always find myself doing on the Neumanns, and needed several dB less of air up on top, as it was already authentically airy on its own. And, the midrange and transients sounded to me at all time clearer & cleaner than the Shure KSM32 or the U87i, which is a big, huge compliment for any microphone. This was even more apparent on drum overheads, with a very flattering cymbal sound without any excessive harshness, an extraordinary 3D image and depth, a really fast, snappy response, and a detailed super clean sound. In this application, the character of the LEWITT 441 FLEX to me sounded more similar to the much loved Shure KSM32 than to the Neumanns, with a similar midrange presence, but, again, audibly more clarity, while compared to the AKGs there was less "zing" and a more realistic, present sound. I practically needed no eq on the overheads, except for a high-pass filter, and it sounded perfect. As a drum room pair, the LEWITTs seemed to favour an older Ludwig drumkit with darker Zildijan K and Meinl Byzance cymbals, as on a brighter Tama and Yamaha kit with Paiste and UFIP cymbals I had to be more careful with positioning in order to not end up with an “overexcited” sound, in terms of high frequencies and brilliance. But, in doing so, I found out that the slightly tilt-eq sculpted sound of these mics seemed to enable me to place them in more unusual room positions, even looking for spots I’d usually avoid like the less well-controlled bass buildup room corners and odd nooks, providing for interesting alternatives that never felt overly muddy. All these were even more easy to experiment with thanks to that “reverse polar pattern” switch feature: it’s refreshing & relaxing to be able to have your microphone pointing downwards from a ceiling or towards you from a corner wall, so you can change its settings, but at the same time have it picking up sound upwards towards that ceiling or into that corner. Another authentic LEWITT innovation on this mic! On strummed steel string acoustic guitar then 441 FLEX was again perfect. Less inclined to boomy soundhole low-mid artifacts than any of the mics I compared it to, more airy than all of them, and never metallic. If you ever think of your sounds as more or less “here” when you listen to them in the control room, from your studio monitors, i.e. more or less present and popping out of your speakers, well, the Lewitt provided clear, present detail and clean transients, painting a vivid and lively soundstage. On nylon string classical guitar, the results were similar. I did find that I could notice both the lighter low end (which I could bring forward with a slight eq boost, as it was all there, just a tad subdued) and the aforementioned 1.5kHz little “absence” dip – it’s a rather crucial frequency range for classical guitar, where there is a delicate balance to be found between how much the strings “speak” to you and how much of that plasticky sound of the fingernails on nylon you notice, so on this application I went with another microphone. But I did use the LEWITTs as a room pair, and their clarity and lack of mud complemented that classical guitar perfectly. Finally, I used my pair of 441 FLEXs to record some late, late night ambience on a rooftop terrace in the Canary Islands. One may argue that the night is the night and silence is silence (or just hiss & noise, if you electronically boost its level) but the fact is that every place has its own sonic signature, and every location some sort of different night sound, an interplay of nature, animals, air currents, and of course human interference. Intending to use this as connecting soundscape audio between some tracks on a classical guitar album I was producing and recording there, I set up the LEWITTs on a stereo bar and mic stand, and ran extralong cables down to the studio. The detail was fantastic, and what surprised me was the actual extension of the microphone’s low end, picking up ultra-low subs from a distant ship’s engine and from the air-conditioning of a distant industrial plant switching on that I didn’t really notice with the naked ear, but that were clearly audible and undistorted on the studio monitors and visible on the spectrum analyser graph. So, slightly subdued low end yes, but only in terms of level, and certainly not hacked off or lacking – quite the opposite, which to me is a testament to the quality of the mic’s capsule and of its electronics amplifying those feeble signals in the lowest Hz range.